At times like these we all wish for an extra 12 hours in the day. Too many games to play, too many responsibilities to fulfill. Nick "bapenguin" Puleo - "I have a lot I'd like to play, lets see what I accomplish. Left 4 Dead 2, Dragon Age Origins, Modern Warfare 2, and Resident Evil 5 PC are all on my radar!" Marc "DjinniMan" Allie - "I'm planning to spend lots of time in Left 4 Dead 2. Other than that, more Half Minute Hero!." Mike "pheriannath" Katsufrakis - "I have a lot to play as well, but almost no time to do it in! Since I've got to work over the weekend, time will be scarce, but I'll spend as much time as I can in Left 4 Dead 2 so I can have my review ready for everyone to enjoy." Jim "txshurricane" McLaughlin - "What little game time I have will be spent on Clone Wars: Republic Heroes and Modern Warfare 2." Katrina "ShadokatRegn" Pawlowski - "I'll be pushing to make time to play Prince of Persia and Borderlands - even if that means forgoing sleep for the weekend." Jason "OrigamiPanther" Love - "My weekend will likely see me splitting my time between slaying darkspawn in Dragon Age: Origins, and hitting zombies with frying pans (*ptong! *) in Left 4 Dead 2." Loren "AgtFox" Halek - "Maybe play some New Super Mario Bros. Wii, but probably just take some time away after getting through and reviewing three games in under a week with over 40 hours of gameplay combined." 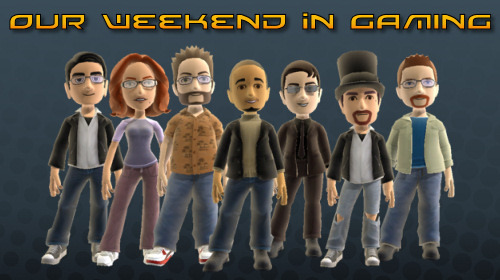 What are your gaming plans for this weekend? Don't forget about our RE5 co-op night tonight! Page created in 0.5305 seconds.